Caroline storms into the house, closely followed by Adam. He wants to explain to her what happened with Jim but Caroline says she doesn't want to hear it - and anyway, she has to get ready for her date with Jim. Cody, Todd, Melissa and Josh are celebrating Cody's release from grounding. She doesn't think she'll be going back in the basketball team though - her mum thinks there would be too many Willises on the team. Todd says he's pulled out too, so he can spend more time with Cody. Doug is telling Pam what happened between Adam and Jim and how cross Caroline is. 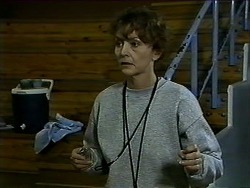 Pam is not impressed - the basketball is supposed to be a bit of fun for a good cause. She doesn't want anything going wrong on the day of the game. Doug jokingly suggests that they should lock Adam and Jim in a room - either they'll bury the hatchet or kill each other! Dorothy is trying on a hideous dress when Ryan comes in. She's going out again tonight and Ryan thinks that she's getting a bit serious about her new boyfriend! Dorothy says she's not going out with Maurice - it's another gentleman. Melissa is talking about drift- net fishing and how cruel it is to animals. Cody doesn't think there's much anyone can do. MELISSA: You could be a vegetarian. Veggies are better for you anyway. TODD: Only freaks like Mr Bishop do that! Melissa points out that Kerry wasn't a freak, and Cody agrees, saying that Paul McCartney is a vegetarian and not a freak either. Melissa reckons she's going to go for it, but Cody thinks it would be hard to get Pam onside. Todd and Josh definitely don't want to do it. Josh heads off for a violin lesson - his mother has enrolled him for lessons with Miss Riley. Melissa is suspicious. Jim and Caroline are having a quiet glass of wine. Caroline can't believe the way Adam acted towards Jim. She keeps ranting and Jim is unable to change the subject. Ryan comes in and collapses on the settee from exhaustion - he's been keeping Joe's round going. But then he stirs himself and hobbles off to basketball practice. HELEN: Hello, Dorothy, the door was open, I hope you don't mind. 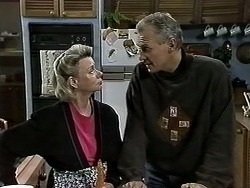 DOROTHY: Not at all, I'm a real Ramsay Street- er these days, an ever-open door! Helen wants to hear all about Dorothy's date and apparently it went well. Ryan overhears and laughs that Dorothy is using the video- dating service. Dorothy warns Ryan not to tease her. Jim comes to see Paul but he's not there - he's gone for a drive with Isabella. Jim invites Caroline to see a movie but she says she'd rather not make any firm plans - she wants to let things ride for a while. 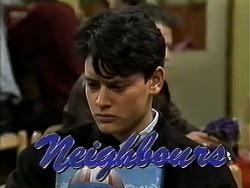 Jim tells Caroline that he thinks Adam is on her mind, but she insists she just doesn't want to be committed to anyone. Jim points out that she spent the whole of yesterday evening talking about Adam. Pam doesn't think that they have enough basketball players for the team. She ropes Cody in to help with dinner but Cody says she can't cook chops, she's decided to eat better. But Pam says she has to eat what she puts in front of her or go without - she can't be fulfilling special requests. Todd and Josh are teasing Melissa about being vegetarian but she won't be moved. She decided to talk to Harold about vegetarianism for advice. Josh says he has to go - he's got another music lesson. Melissa tells Todd that Josh has been acting oddly lately - she thinks there's something bugging him. The Ramsay street- ers are practising and Adam and Jim are clashing again. Pam tells them off and end up sending Adam off for fouling Jim. She sends Todd, who is spectating, on instead. 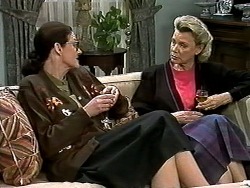 Dorothy tells Helen that her date last night was a nice man, but they didn't really have a lot in common. But he was a mechanic, and offered to fix her car at cost price(!) She's still got 3 or 4 dates to go. Helen tells Dorothy that she admires her for going for it with the dating agency - she'd be terrified. She wonders if Dorothy is worried about men getting a bit physical, but just then Ryan comes in, so that ends the conversation. Adam is moaning at Pam for sending him off but Pam says he deserved it. Cody points out that it's all over Caroline and Adam tells her to shut up. But Doug agrees - Jim is far too old for Caroline. Cody is trying to avoid eating her meat and Pam tells her off. Helen isn't impressed to hear about Jim and Adam's antics but Jim says it's all Adam's fault. Helen thinks he's being a bit petty, but Jim says there's more too it - Adam keeps causing trouble between him and Caroline. Helen says she doesn't think there was much future in the relationship anyway. Des comes over to talk to Caroline (who is wearing a Star Trek: Deep Space Nine uniform it seems!). He laughs at her being such a femme fatale but she is not impressed with his comments. Todd comes in and asks Josh what he's got in his folder. He snatches it off him and finds a heart drawn inside with the name "Katrina". Todd tells him off - he's supposed to be with Melissa, he'd better not be cheating on her!